We’d like to thank Justin for sharing today’s story. 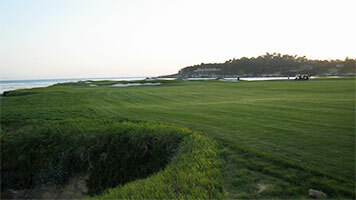 In ’92 or ’93, I came in from Oregon to visit with my folks at Pebble Beach. We were there for a Pro-Am Golf Tournament put on by Peter Jacobsen, a PGA pro who was a friend of ours. Bill Murray was his partner for the weekend and the shenanigans were many. But the crowning moment was when Bill hit an incredible shot about a foot from the pin on the back 9, and the gallery went wild. Bill turned, addressed the crowd, and took a big bow. He then walked up to my mother (my father was right there) put his hands around her waist, leaned in, and planted a 5 second long wet kiss… on her nose. He then gave my dad his golf glove and walked away.